PLEASE NOTE: This is the preview of the 2006 show. For the Luchtmacht Open Dagen 2007 Preview click here. 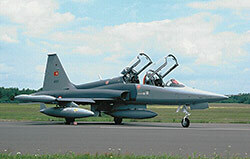 In 2006, the KLu Open Dagen (RNLAF Open Days) will be held at Leeuwarden AB. 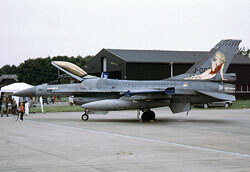 Leeuwarden AB is one of the two F-16 bases (Twenthe AB closed in 2005) and is located in the Northwestern part of the Netherlands. The base will open its doors to the public on the 16th and 17th of June, from 8.00 AM until about 5.00 PM. The entrance is free, although there normally is a small fee for parking or use of transportation onto the base area. 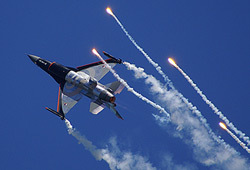 Surely, spectacular displays will once again include the exciting Air Power Demo and the amazing RNLAF F-16 Solo Display. However this year, the show coincides with Fighter Weapon Instructor Training (FWIT), which will hopefully result in some more aircraft at the show. Also, the RNLAF managed to book the U.S. Navy's Blue Angels display team. For the first time since 1992, the Blue Angels will once again perform in Europe. Flying the F/A-18 Hornet in bright blue-yellow colours, as well as their C-130 'Fat Albert', the Blue Angels display will be welcome change in the flying programme. Another special item, will be the CH-47D Chinook demonstrating its fire fighting role with the Bambi Bucket. Below is a provisional list of participating aircraft, it includes privately-owned warbirds and other civil airplanes for both days. Right now, it seems the programme only includes the Red Arrows on Friday in the flying show, however it is possible they depart on Saturday during the show. Greece TA-7C Corsair II 1x S - ? In addition to the listed aircraft, one can expect to see equipment of non-flying military units (such as vehicles, Patriot unit, crash tender) as well as aircraft from the local aeroclub. In addition, there are quite a number of exhibitions for kids and adults alike. Follow the signs “OPEN DAG KONINKIJKE LUCHTMACHT” to the A-31. From Marssum you will directed to a parking spot on the A-31. From 0730 hrs onwards busses provide transportation to the gate at the Schapenlaan. If this part of the A-31 becomes full, the southern section between Dronrijp and Franeker will also be used for parking. Follow the signs “OPEN DAG KONINKLIJKE LUCHTMACHT” on the A-32/N-31/N-32. Depending on the traffic situation, you will be directed to the parking at the A-31, the 'FEC' area or the 'Groene Ster'. From 0730 hrs onwards busses will take you to the gate at the Schapenlaan. If you have been directed to the 'Groene Ster', you can enter the airbase at the Kampweg. From the N-355/N-356, at Tietjerk follow the signs “OPEN DAG KONINKLIJKE LUCHTMACHT”. Parking will take place at parking lots the 'Groene Ster' as well as the northern section of the N-355. From 0730 hrs busses will drive to the Kampweg, where you can enter at the gate. Visitors from the direction of Stiens / Hallum are recommended to use public transportation of come by bicycle. If you would decide to come by car, follow the signs “OPEN DAG KONINKLIJKE LUCHTMACHT” on the N-357. Parking available at the two parking lots the 'It Noarderfjild' in Stiens. If these become full, you are directed to the 'Groene Ster' or N-355. It is not possible to park your car in the area surrounding the airbase! Follow directions by police or military personell. After parking, you can get on one of the busses (at no charge) which will take you to the gate. On the airbase, during the day, you can buy your parking coin. When leaving the parking lot after the show, you have to hand over your coin to the parking attendants. Last year, the KLu Open Dagen were a great success because of the superb weather. Last year, the open days attracted 295,000 visitors. It is recommended to come to the show as early as possible, so you are at the gate at 0800 hrs or earlier. The first busses from the parking lot to the gate leave at 0730 hrs. If you are able to come with public transportation, you are advised to do so. Although the weather was great last year, the show has often been plagued by overcast and rainy weather in the past, even in June. So be prepared for typical Dutch (or English if you like) weather.